I had more fun doing this than I thought. I'll happily do 3.0, whatever team is needed. If I could make a suggestion, I think for the last mock draft you should let someone control the Bills rather than doing a community poll. It's all just for fun anyways. The value restrictions on moving up made things a lot more difficult. I don't think the Bills would have to pay a 300 point premium to move to 5 in the real draft. Here was the logic. Last year, maybe because of the supply/demand, that’s what teams overpaid on average to move within the top 10. Also, when it was just straight up, we had almost too many, possibly unrealistic trades. I think people traded just for the sake of trading. Thanks, but in no way do I want that burden. I have an idea...maybe lets see who wants to volunteer to draft for the Bills...then do a poll on who should be the one. So if say 10 of us want to be the Bills, put a poll up on who we all think should be chosen to choose for the Bills. 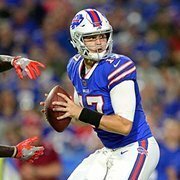 We can choose someone we feel will be most realistic on how the Bills will handle the picks. Also, I am in if you do another one of these. And yeah, some of the trades were just not realistic nor some of the picks. I know you will be making another sign up sheet. BUT I would love to be the Packers in 3.0. That's the second team i root for in my household. My wife is a cheesehead. Sorry, didnt see what you are referring to. If people are throwing names into the hat for the Bills, I would throw mine in. 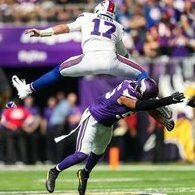 Honestly, I think there is very little chance the Bills trade up from 9. The 2nd round pick this year is way too valuable as it can be used to trade up from to get back into the first, can be used in a trade to get Clowney/Clark, etc etc. If the Bills were to trade up from 9, I seriously doubt they would go up high enough that it would cost us our 2nd. There is too much talent on the board at 9 that its just not worth giving up our 2nd round pick. I do however think its quite probable we trade up, even multiple times with our other picks. I still think Bills leave the first 2 rounds of this draft with 3 players as opposed to one. PS: And if you are taking sign up sheets for version 3.0 - In this version I was Broncos and Rams. Im fine doing the same, but I would rather switch it up. So if not already claimed, I would like to do the Giants next one. There situation is one of the ones I find most interesting this draft.